There’s so much we experience in our lives. There are the big moments that shape us – graduation, a first job, getting married and starting a family, new home and retirement. When we reflect on our lives, it’s these memories and milestones that may come to mind first. But a life story is so much more than that. The small moments and people we meet along life’s journey are a part of us and helped shape who we are and what we value. Although we may know about some of the big moments in the lives of our loved ones, we may not know much about the other experiences and people who helped shape them. Sitting down with our loved ones to talk about their lives can be rich and satisfying. Learning about memorable events and people, places and favorite activities, values and lessons they have learned, can help bring us closer to those we care about most. Having the talk of a lifetime can make the difference of a lifetime. It can help reacquaint us with our loved ones and help us get to know them in a new and different way. Finding a way to start talking with a loved one may be the most difficult part; however, we might find that once the conversation starts, it may be hard to stop. 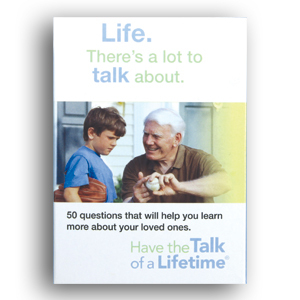 To find out more about how to Have the Talk of a LifetimeTM with your loved one, visit talkofalifetime.org. There you can download a free brochure that will help you begin the conversation. Start having the Talk of a Lifetime now! Learn more about the Have the Talk of a Lifetime Conversation Cards!